Ralph Breaks the Internet: Wreck-It Ralph 2 was first teased at the D23 Expo in the summer of 2017 where a bunch of Disney voice actresses came out on the stage to preview a scene which includes Vanellope hanging out with classic Disney Princesses. Since then, we've seen a lot more from the scene, which has been hyped since last summer. However, a lot of fans were left wondering why Princess Leia from the Star Wars franchise was left out of the scene. In a recent interview, Wreck-It Ralph 2 co-director Rich Moore discussed the somewhat confusing process of choosing the Disney Princesses that made the cut for the sequel. Along with Princess Leia, there are a few others that have been left out as well. But in the end, it seems that the crew of Wreck-It Ralph 2 went with the more traditional Disney princesses. Moore explains. "We decided... I mean there are a lot of princesses that are from Disney movies that are not part of the canonized Disney princesses, you know, and I don't know how they're chosen. I don't know how it goes on. I think it's kinda like the Vatican where smoke comes out of a chimney. And Moana is now a Disney princess. So, we decided we're going to use the canonized group of princesses, known as the Disney Princesses. Not that we don't love Princess Leia and Kida (from Atlantis: The Lost Empire) and Meg from Hercules and Esmerelda from The Hunchback Of Notre Dame. But we decided we're going to go with the official Disney princesses." They had to draw the line somewhere with the Disney Princesses in Wreck-It Ralph 2, but there are already elements of Star Wars shown leading up to the aforementioned scene. 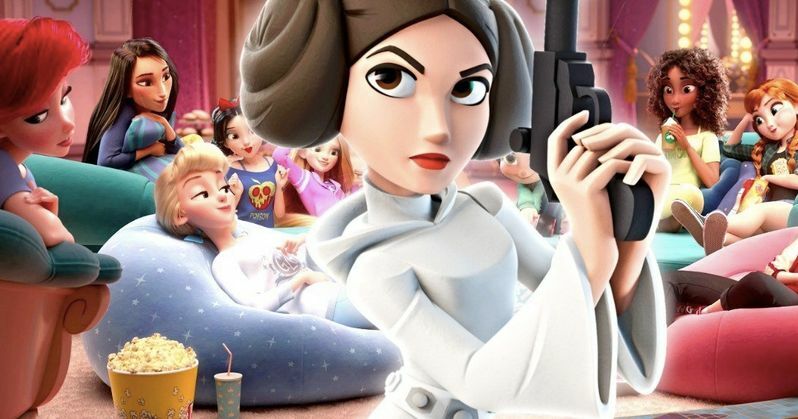 Throwing in Princess Leia seems like a no-brainer, especially since we see Stormtroopers right before Vanellope crashes the party. However, it looks like Leia is not included on the "official" Disney Princess roster. While it's not clear how the "official" Disney Princess roster is decided, Pamela Ribon, who voices Snow White in Wreck-It Ralph 2, had her own criteria that Princess Leia did not meet. It all seems to be up to whomever you ask at the time. For Ribon, Leia isn't in that group and the same goes for Rich Moore. Ribon had this to say. "I really thought of the princesses that walk through Disneyland as the Disney Princesses, Disney animation specifically, you know, because that's where I feel like Vanellope is of this house, and she gets to stand next to the same princesses that this building made... I wouldn't have thought in this room you'd have Princess Leia because she didn't seem like who Vanellope was talking to in that version." Disney certainly doesn't have to go out of their way to include Star Wars in everything that they do from here on out, but a nod to Carrie Fisher in Wreck-It Ralph 2 could have been pretty special. Though, Fisher may have had mixed feelings getting lumped in with a bunch of classic Disney Princesses. The whole thing doesn't really seem like her style, but it still would have been pretty cool. You can read more about what Rich Moore and Pamela Ribon had to say about the Disney Princess roster over at CinemaBlend.